The Linesville Community Business Alliance (LCBA) proudly announces its 1ST Annual Linesville Heritage Weekend Celebration. Featuring the work of world-renowned artist, Robert Griffing, born and raised in Linesville, PA. His artworks depicts the Eastern American Indian and the period between 1750 and 1780. Also, the weekend celebrates the Griffing family for their long genealogical connection to Linesville. Robert and his brother Jim can trace their lineage all the way back to Amos Line, founder of Linesville back in 1824. The Heritage Weekend is an opportunity to travel back in time to experience the roots of Linesville’s history, a city rich in frontier and Native American culture. Linesville’s storied and magical past will come alive with two days of fun and adventure for the whole family. This is a chance for visitors to meet the Native American models and military re-enactors who helped make Griffing’s art come to life. Traders will demonstrate how trade was conducted between Europeans and Natives. Also, Authentic Native American dancers will be performing. This is also an entertaining weekend of delicious food and refreshments, Native American educational displays and interaction, Camps for Virginian Troops, Roger’s Rangers and Boy Scouts, Community Market with arts and crafts from local artists, artifacts, Trading Post and a non-denominational devotion service. Keep up to date on all the latest news and information. Get recognized for your support of this special town event! Want to help make this event a bigger success? We’re in need of helping hands. Get a copy of the event schedule for your phone or to print out. An invite-only special event for sponsors and performers, where Robert Griffing will be present and talk about certain work at a casual pace. Become part of over 400 people who visit annually to check out all the items on display! Gallery opens. Limited edition prints of paintings and the latest book is available for purchase. Griffing the artist will be present at the gallery until 11am. Robert Griffing will be appearing at the gallery, perfect opportunity to get him to sign the new book. Presented by LCBA and generously sponsored by Lisk’s Heritage Farm, the concert kicks off the week-long Hillbilly Flyin’ week! Tickets are $10 in advance, $15 at the gate. What Happened in the Pymatuning Swamp? About 3 miles from where Robert Griffing grew up in Linesville PA, lies the hull of a sunken ship first discovered in the Pymatuning Swamp about 200 years ago. 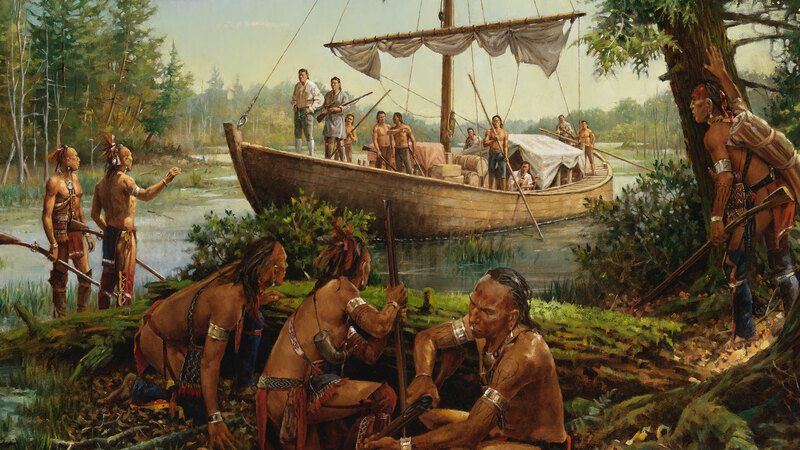 Later the creation of Pymatuning Lake would hide her secrets forever. Robert first heard the stories of the ship from one of his favorite teachers, Sara Egan, and it has always intrigued him. There are many theories about its origin. Traders, explorers and even a romantic version. What ever one you choose to believe, there is one common fact based on the many descriptions we have of the ship, that leans to a certain time period. The 60’ x 12’ craft is of the Durham style and probably from the late 18th century. That is the time chosen for the painting. So, is it traders or is it the ship from New Orleans carrying a Spanish princess trying to find passage to the Great Lakes? The truth is we will probably never know, but we will always wonder…What happened in the Pymatuning swamp? The original painting will be on display at the Griffing Gallery during the event. Canvas and small decorator prints available. Robert’s long awaited book “An American Journey” will also be available for purchasing. 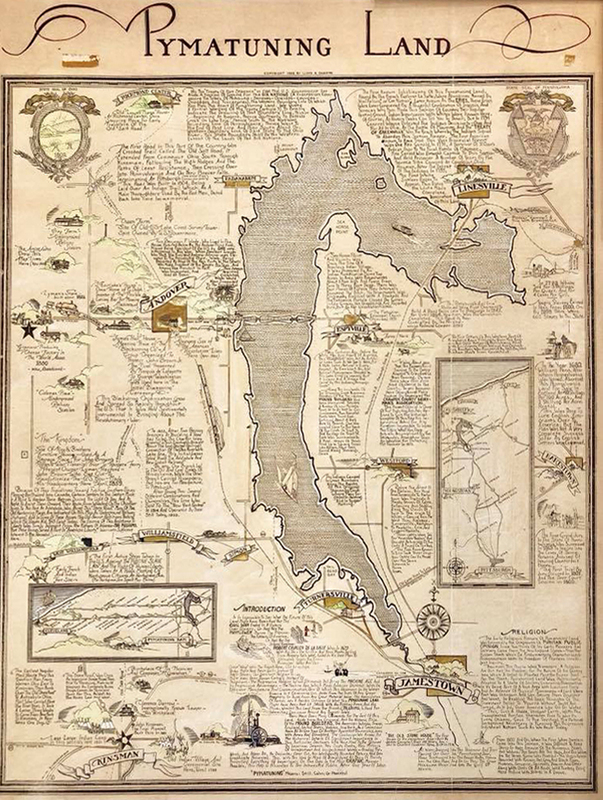 This beautiful 1933 map was made by Lloyd R. Osborne, probably to commemorate Pymatuning Lake’s completion. Illustrated carefully in pen and ink, Llyod wrote down wonderful stories of historical interest, including Indian villages and places unheard of around the Lake in both Ohio and Pennsylvania. Very few copies of these maps went out in 1933. Fourteen year old Robert Griffing was fortunate to be gifted one by his uncle, Tom Collins. 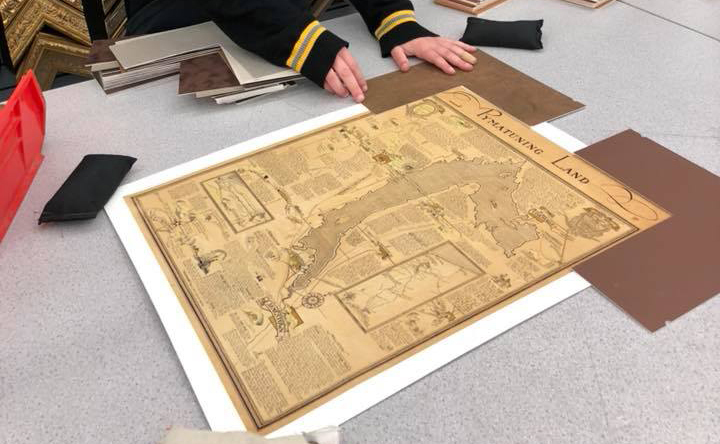 His uncle recognized Robert’s keen interest in Native American and local history and this map is a source of great inspiration throughout his life that influenced his entire body of work that we see today. Robert Griffing’s original copy may be the only one that remains in existence. Today, the gift continues — stunning 20” x 16” reproductions on quality paper is available for purchase at $29.95. All proceeds from the map purchase will go to funding L.C.B.A.’s First Annual Heritage Weekend, featuring Robert Griffing!